By far the largest lake of all, is Lake Superior located in the Northeastern edge of Minnesota bordering Ontario, Canada, Michigan and Wisconsin and stretching 1,300 miles/2,092 kilometers around. Lake Superior is the largest body of freshwater by area in the world and around her rocky shores are some of the most pristine, untouched stretches of nature in the country. 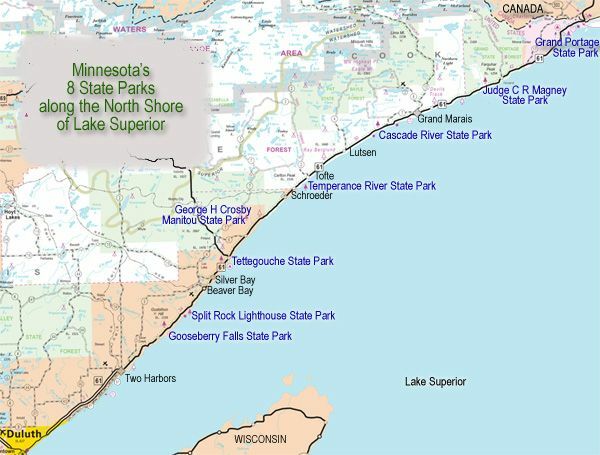 The North Shore of Lake Superior in particular claims 8 State Parks, and endless opportunities for hiking, camping, biking, fishing and exploring wildlife. It is also home to the spectacular Superior Hiking Trail (a 275 mile/442 km long footpath that follows the ridge line overlooking Lake Superior) and the start of the Boundary Waters Canoe and Wilderness Area which spreads into Canada and offers over 1,000 of untouched lakes and miles of uninhabited wilderness only accessible by canoe and foot. If you are searching for the path not taken, you will find it there. Overall, the North Shore is a hikers paradise and a true treasure. Less than four hours away from the Twin Cities of Minneapolis and St. Paul, lay hundreds of opportunities to explore pure and relatively untouched nature. The Superior Hiking trail in particular affords a wide variety of hiking scenery traveling through forests of birch, aspen, pine, fir, and cedar alongside dramatic waterfalls, creeks, and rivers as well as abundant wildlife (bears and moose to name a few, if you are lucky or unlucky, depending on how you look at it). 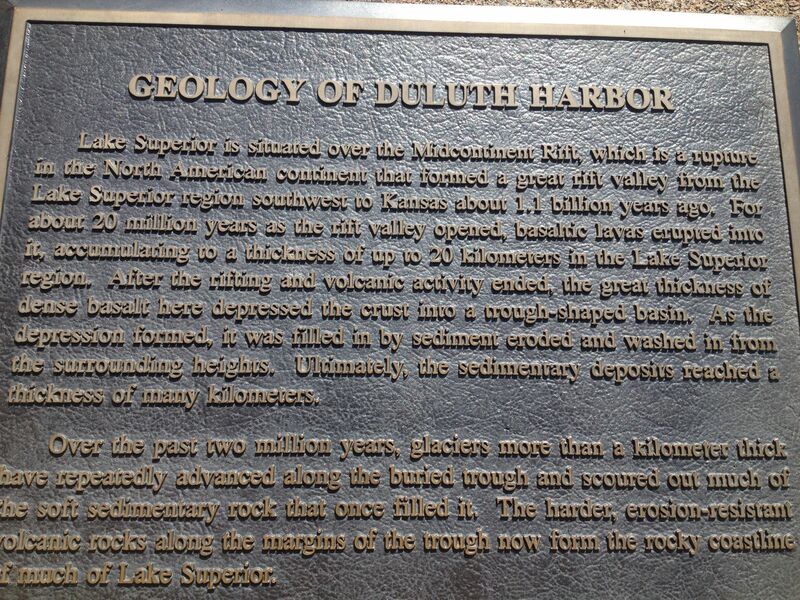 The North Shore starts in Duluth and branches out north-east for over 150 miles until it reaches Canada. As you drive through the outskirts of the Twin Cities and pass lakes, towns and then more rural areas, it always amazes me the moment when you finally reach Duluth and see Lake Superior for the first time. It is so massive, so grand and appears as a majestic swash of blue out of the middle of nowhere. 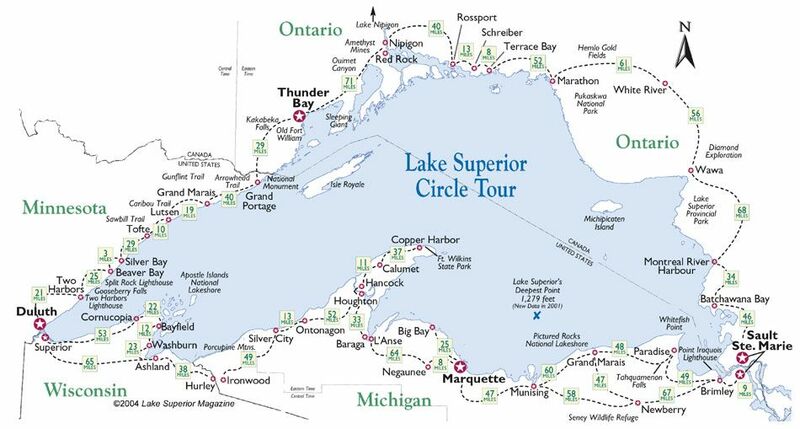 As seen in this diagram, Lake Superior is very narrow in Duluth and you can easily see across into Wisconsin for some time as you drive up the North Shore. The further you drive north, the more grand Lake Superior seems and it looks almost like an ocean or a sea. Photo Credit: University of Minnesota-Duluth. Google images. Duluth has become a destination in its own right, being the second largest city in Minnesota and home to several universities as well. It is also known for the infamous Grandma’s Marathon in which you start in Two Harbors and finish in Duluth near Grandma’s bar and tavern, a popular college hangout. My husband Paul did it back in our marathon days and it is quite a gorgeous marathon as long as the weather is nice and not too windy. It can also be a bit daunting as you can see the point of Duluth from the start of the marathon over 26 miles away! 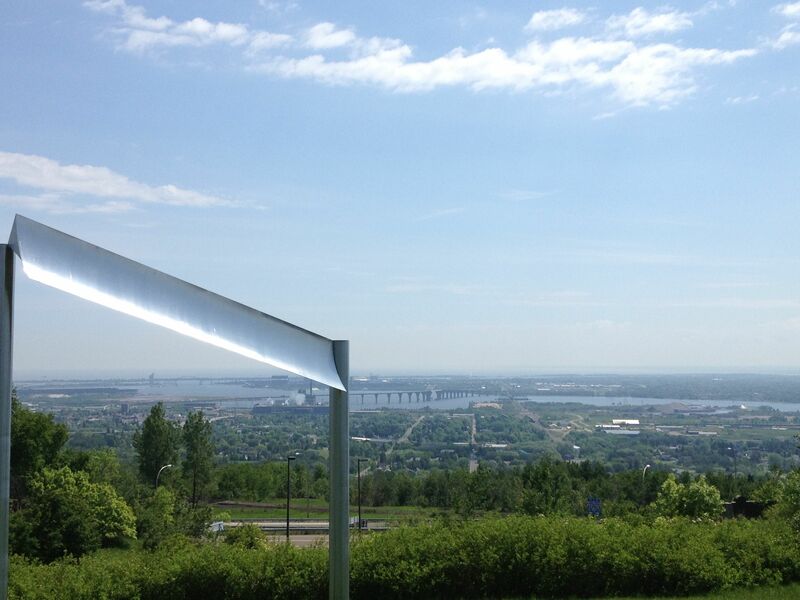 View as you first pull into Duluth from the Wayside Rest area looking north towards the harbor and city. Duluth is a bustling seaport shipping iron ore and raw goods along the Great Lakes shipping route. View looking south showing the small start of Lake Superior and Wisconsin not far off across the water. The impressive history of this land and how this magnificent rocky landscape was created well before our day. The North Shore has been a special place all my life. Every fall since I was a baby, my parents would pack up our old station wagon and do the drive north to spend a weekend enjoying the splendid fall colors and hiking the wonderful trails. This tradition started before I could walk and ended sadly when I left for college at the age of 18. The last time I’d been “up north” was for my sister’s wedding eight years ago. Then children and overall busy life got in the way. This trip was going to be special because it was the first time my children would get to see the North Shore and my parents would be joining us for the long weekend. It was about time I introduced them to the wonders of the North Shore. We left on Thursday morning, bright and early, beaming with excitement. Our first stop along the way was to one of the first State Parks along Highway 61 north, Gooseberry Falls. The kids were feeling restless with many “Are we there yet?” coming out of their tired mouths. It was time to get them out of the car and show them what this land is made of. They weren’t disappointed. Nor was I.
I could have spent all day hiking and exploring the beauties of this place yet I knew the kids were restless and eager to be on our way. My first walk into the woods of the North Shore proved it was just as I had remembered as a child: Magical, pure and untouched. I had found my serenity and could hardly wait for the days to come. 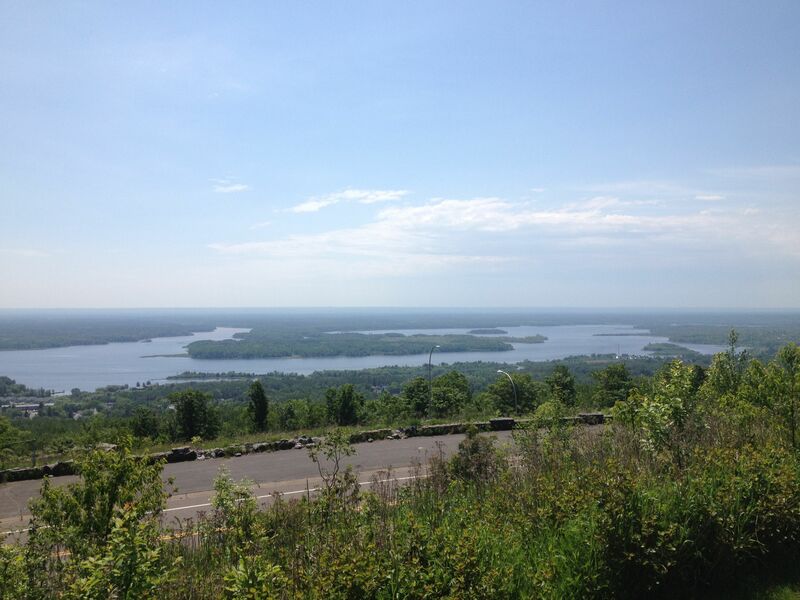 Stay tuned…many more hikes to follow! The North Shore is Beautiful Country – loving your photos – thanks for sharing! Delightful photos! I hope I get to go there someday! I’ve never seen Lake Superior in person, but, gosh, it looks gorgeous. Loved the roots on the tree. I bet you and Sara would LOVE it!!!! It has a huge artist community too! You’re seriously lucky to live where you live Nicole! It looks like fantastic hiking country!!! Yes, Minnesota is quite beautiful. It really is.